We were at a scantily populated park early on Sunday morning. When we bundled into the car, Agastya piped up from the back “Daddy, let’s not go home.” My thoughts exactly. If I had ever needed proof that this was my son, with my exact set of peripatetic genes, here it was. 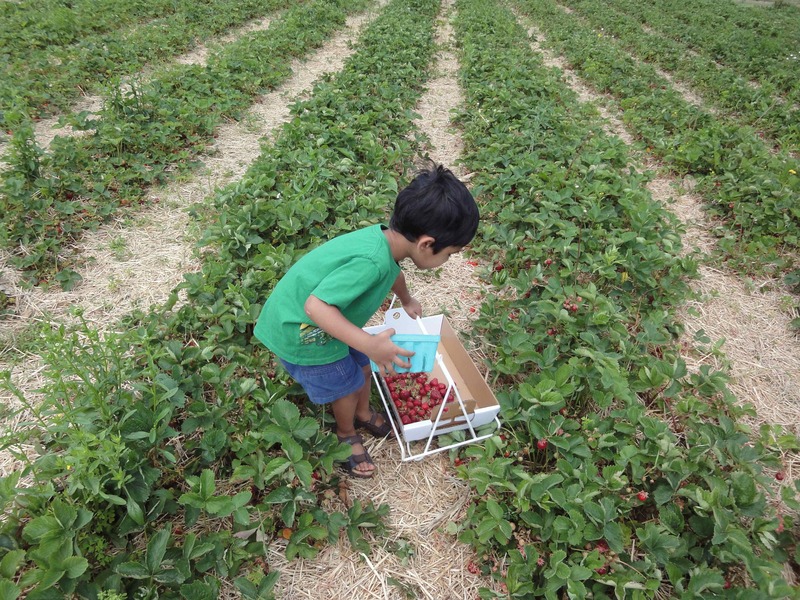 “How about strawberry picking,” I said, watching Agastya brighten at the suggestion. The sun was beginning to show through the clouds. An hour later, we were at Peterson’s Farm in Flemington, NJ. Little globules of fruit twinkled up from under the leaves of the strawberry runners. The earth smelled fresh, there was a small breeze, and a friendly dog came to sample our sugar sweet fruit. 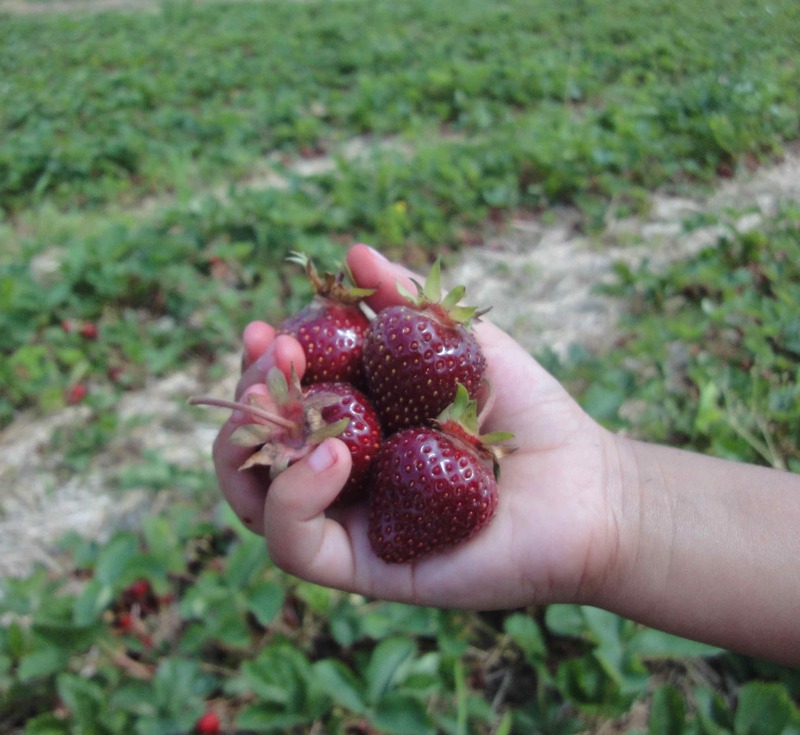 I had two small red-streaked helpers who adored strawberries. We ate some of the berries last night in a salad with a mild honey lavender goat cheese from Nettlemeadow farm. I ate some plain strawberries this morning for breakfast. What was of course lingering in my mind was this rustic and pretty strawberry cake from Smitten Kitchen. I made the cake but cut Deb’s recipe in half to assuage my feelings of guilt. 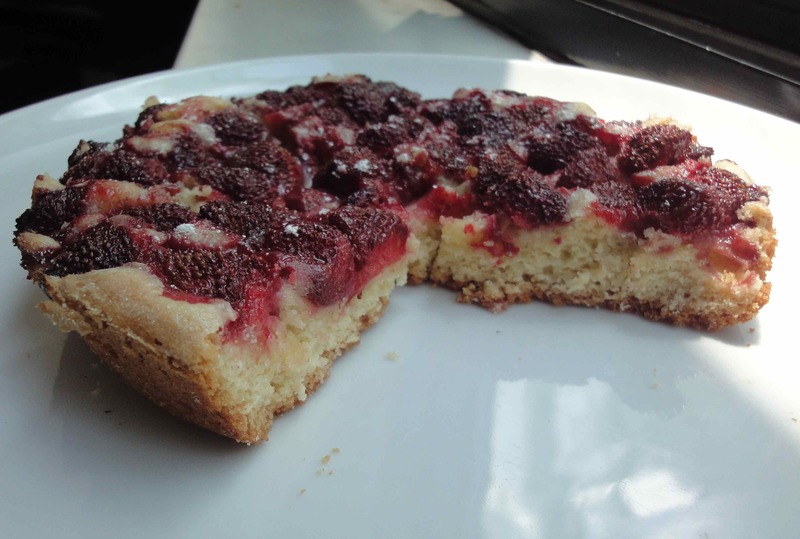 This precious cake oozes with strawberries, and has a crumbly, biscuit-like texture. It feels like strawberry cake, scone, biscuit, pie, all rolled into one, and is immensely satisfying to bake and eat. 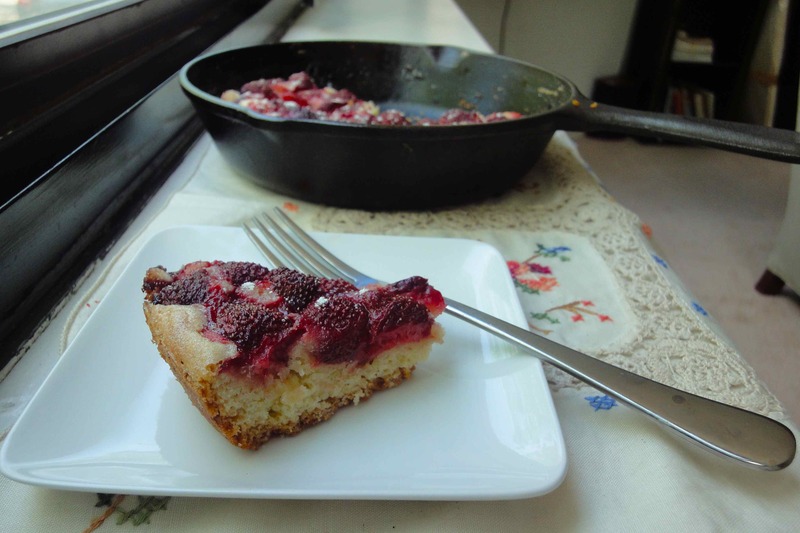 Small very ripe strawberries taste best in this cake. 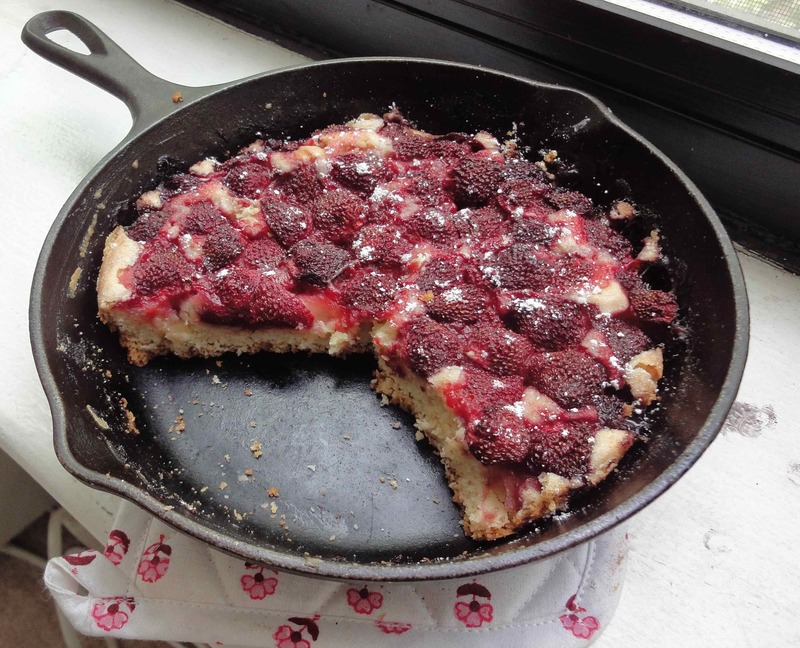 On a whim, I’ve used a cast iron skillet but a more conventional pie dish or cake pan would work too. Double the recipe if you need to serve more than 6. 1. Heat the oven to 350F. Whisk the flour, baking powder and salt and keep aside. Butter an 8” cake pan or pie dish. 2. With an electric mixer on the lowest setting, beat the sugar and the butter for about 2 minutes. Add the egg, milk and vanilla essence and beat for another few seconds until combined. 3. Now gently fold in the flour mixture with a spatula. Put the batter in the cake pan. Layer on top with cut strawberries face down as close together as possible in a single layer, doubling up if needed. Sprinkle the remaining tablespoonful of sugar on top of the strawberries. 4. Bake at 350 for 10 minutes, then turn the temperature down to 325F and bake for about an hour or more until a knife inserted in the middle comes out clean. 5. Cool, turn out of pan (or can leave in a pretty dish), dust confectioner’s sugar and serve by itself or with heavy whipped cream / vanilla ice-cream. Devika pulled off another crowd pleaser thanks to your awesome recipe.. Loved the soft berries on top of a light crust!!! Shefali, I’m thrilled you tried it. I’m considering trying this cake with other berries as they come into season.